It looks like magic, but it's really science at work! In ancient times magicians wielded tremendous power in society. Of course today we realize that the mysterious world of magic is truly the fascinating world of science. All magic is comprised of illusions and the majority of illusions are based on scientific principles. Come with us on a journey of exploration into the science behind the magic! 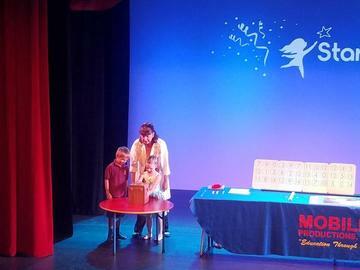 The Magic of Science allows everyone, both in the audience and on stage, to become a magician! Everything done in this 45-minute science program looks like a real magic trick. The only real trick is that everything done is science at work. Chemistry, light, magnetism, optical illusions, physics, and mathematics are all demonstrated in an energetic performance perfect for children. Everything performed has a scientific principle behind it, however each of these topics will appear to the audience as a challenging and astonishing magic trick. If that wasn't cool enough...sometimes we'll tell you how to do the trick at home! All proceeds go toward the Performing Arts program at Starbright School. The Performing Arts program at Starbright encourages students age 3 years and older to discover and develop their talents for dance, choir, and musical theater. Choir and Dance students perform in the Annual Concerts to showcase their accomplishments. All Starbright Theater classes culminate in a production of a musical. Starbright Theater produces 15-20 musicals per year starring students ages 3-14.